Dr. Edgar D. Mitchell Apollo 14 Astronaut and the 6th person to walk on the moon died following a short illness on Feb 4, 2016 at a hospice in West Palm Beach FL. He died at age 85 and lived in Lake Worth, FL. 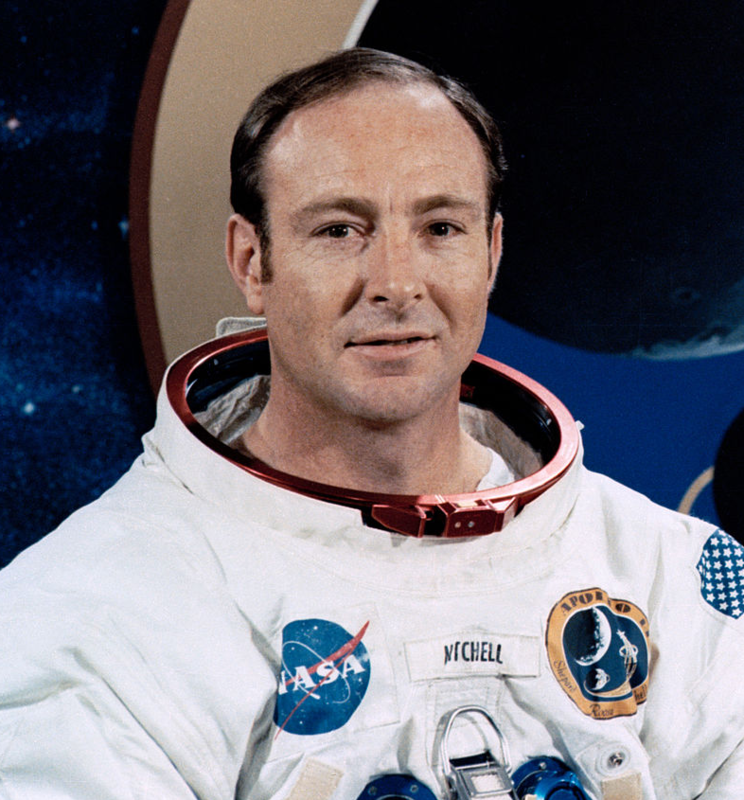 "Edgar Mitchell will go down in history as one of the truly great explorers of our era, not only for his epic journey aboard Apollo 14, but especially for the great explorations into the nature of consciousness and ultimate reality, all triggered by his extraordinary epiphany while returning from the moon in February 1971. Our world is on a far more favorable trajectory, thanks to Edgar and his tremendous intellect, vision and courage — and especially his love for humanity." 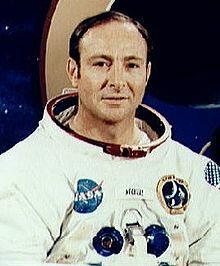 On January 31, 1971, Dr. Edgar Mitchell, then a U.S. Navy Captain, embarked on a round-trip journey through outer space of some 500,000 miles that resulted in becoming the sixth man to walk on the moon. That historic journey terminated safely nine days later on February 9, 1971 and was made in the company of two other men of valor Admiral Alan Shepard and Colonel Stuart Roosa. Scientist, test pilot, naval officer, astronaut, entrepreneur, author and lecturer, Dr. Mitchell's extraordinary and varied career personified humankind's eternal thrust to widen its horizons as well as explore its inner soul. His academic background included a Bachelor of Science in Industrial Management from Carnegie Mellon University in 1952, a Bachelor of Science in Aeronautics from the U.S. Naval Postgraduate School in 1961 and a Doctor of Science degree in Aeronautics and Astronautics from the Massachusetts Institute of Technology in 1964. In addition, he received four honorary doctorates from New Mexico State University, the University of Akron, Carnegie Mellon University and Embry-Riddle University. In 1973, a year after he retired from the U.S. Navy and the Astronaut Program, Dr. Mitchell founded the Insti¬tute of Noetic Sciences, a foundation organized to sponsor research in the nature of consciousness. He was also the co founder of the Association of Space Explorers, an international organization founded in 1984 for all who share the experience of space travel. He later served as the first chairman of Eternea, Inc. a research organization dedicated to understanding consciousness and its implications concerning the convergence of science and spirituality. All of these organizations are educational organizations developed to provide new understanding of the human condition resulting from the epoch of space exploration. He was the author of Psychic Exploration: A Challenge for Science, G.P. Putnam's Sons, 1974, a major refer¬ence book; and The Way of the Explorer Putnam 1996. He was also author and/or interviewee in dozens of articles and essays in both professional and popular periodicals. As a lecturer, he delivered countless addresses on cosmology, the nature of consciousness, human potential, and topics relating to the evolving future of the species on planet Earth. His most current lecture series discussed the implica¬tions of recent discoveries in science as they affect our individual lives in the home, the workplace and society at large. As a futurist he lectured extensively on topics related to the sustainability of planet Earth and all its inhabitants. He was a frequent guest on radio and television talk shows and was featured in several documentary films relative to his interests. For an excellent video on Dr. Mitchell's views on sustainability click here. Retiring from the government service in 1972, Dr. Mitchell continued to write, speak and do research for a number of new books and journal articles. He was a consultant to a limited number of corporations and foundations. 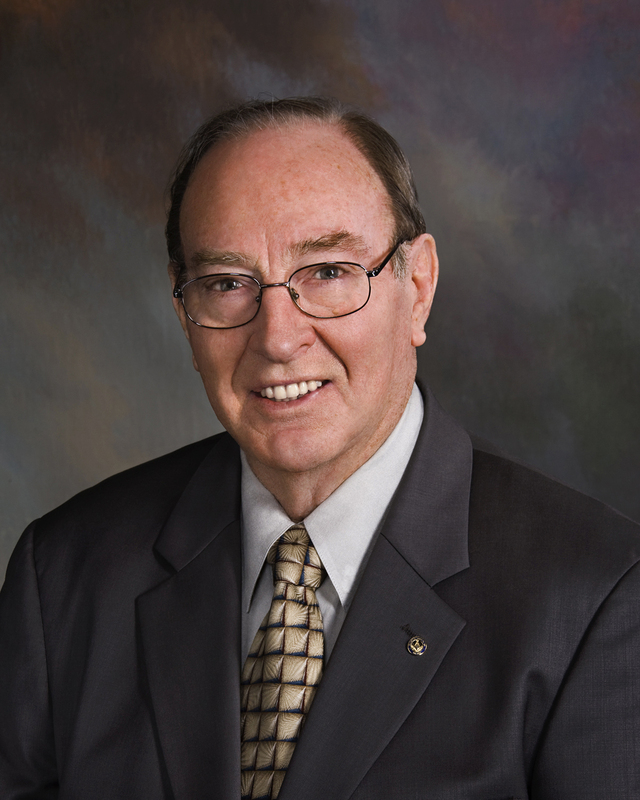 Dr. Mitchell's honors and awards included the Presidential Medal of Freedom, the USN Distinguished Serv¬ice Medal, the NASA Distinguished Service Medal and the NASA Group Achievement Award (three times), and a 2005 nominee for the Nobel Peace Prize. "Suddenly from behind the rim of the moon, in long, slow motion moments of immense majesty, there emerges a sparkling blue and white jewel, a light, delicate sky blue sphere laced with slowly swirling veils of white, rising gradually like a small pearl in a thick sea of black mystery -- It takes more than a moment to fully realize this is Earth home." "On the return trip home, gazing through 240,000 miles of space toward the stars and the planet from which I had come, I suddenly experienced the universe as intelligent, loving, and harmonious." "My view of our planet was a glimpse of divinity." "When I went to the moon, I was as pragmatic a test pilot, engineer, and scientist as any of my colleagues -- But there was another aspect to my experience during Apollo 14, and it began with the breathtaking experience of seeing planet earth floating in the vastness of space. The first thing that came to mind as I looked at earth was its incredible beauty - a splendid blue and white jewel suspended against a velvet black sky. How peacefully, how harmoniously, how marvelously it seemed to fit into the evolutionary pattern by which the universe is maintained. In a peak experience, the presence of divinity became almost palpable and I knew that life in the universe was not just an accident based on random process. … It was knowledge gained through private subjective awareness, but it was - and still is - every bit as real as the objective data upon which, say, the navigational program or the communications system were based. Clearly, the universe had meaning and direction … an unseen dimension behind the visible creation that gives it an intelligent design and that gives life purpose." "When our beautiful and fragile planet is viewed from space, you don’t see any boundaries separating the countries of Earth. You realize that everything on Earth is interconnected as a living system; all creatures on the planet breathe the same air, drink the same water and share the Earth’s huge but finite resources." "When we finally travel to Mars, we will not say that we came for the United States, from Europe, from Russia, from China or any other country. We will say that we came from Earth, our home and beautiful oasis in the velvety blackness and hostility of empty space." "A few weeks before he passed away, I was visiting Edgar at his home in Lake Worth, Florida. He was sitting in his favorite recliner surrounded by great books, two beautiful German shepards and a colorful array of Apollo 14 memorabilia. A close family friend spontaneously asked him in my presence what his most important parting guidance would be to his fellow human beings. He reflected pensively for a few moments and then said, "To serve the greater good." After the family friend left, I asked Edgar how he would advise people to serve the greater good. Without pausing to think, he quickly answered, "By remembering to love one another each and every day." While he did not offer any last words before he left this world for the next at about 9:30 pm EST on February 4th, I doubt his parting wisdom would have been any different than these comments he made just a few weeks before his passing. The fact that Edgar shuffled off his mortal coil just about 7 hours shy of the exact moment in time when he landed on the moon at 4:18 a.m. EST forty-five years ago on February 5, 1971, speaks volumes to those of us still here in this realm of existence able to comprehend the tremendous symbolic significance of this great final feat. Edgar lifted off yet again from this earth, 45 years later, to experience a rocket ride far more thrilling than the Saturn Five, on an endless journey to explore a new frontier far more magnificent than the moon. Bravo, Edgar! By timing your death as you surely did, you sent yet another powerful message to us all about the limitless power of our consciousness to accomplish our intention, even to determine the timing of our own death at least to some extent, which many hospice experts will attest happens often among terminally ill patients in their care. A thousand times thank you Edgar for your many priceless contributions to the evolution of humanity, and for reminding us about the power of intention through timing your own death to coincide with the Apollo 14 mission. I feel certain you did it to underscore the importance of your parting wisdom to your fellow human beings, that we should awaken to the boundless power of our consciousness in service to the greater good in the spirit of unconditional love. Until we meet again my friend in the eternal now and the infinite here, much love to you always. You will be sorely missed and fondly remembered by the millions you inspired all over the world."